Artistic innovation is only limited by the imagination..and let’s be realistic, also by the gathering of the needed medium – effectively illustrating the object assemblage by expressing the artist’s initial visualization. These unconventional mosaic artworks come to us from artists all round the world. Utilizing various physical objects from butterfly wings to scanning barcodes. 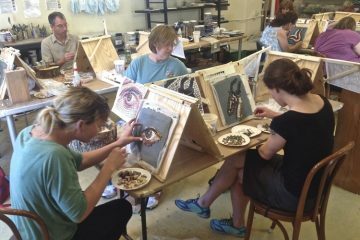 Many artists are nowadays using several inventive materials bringing a fresh approach to the archaic form of art: the mosaic. We present you some of the most avant-garde mosaic ideas from around the globe revealing a vast artistic expression. 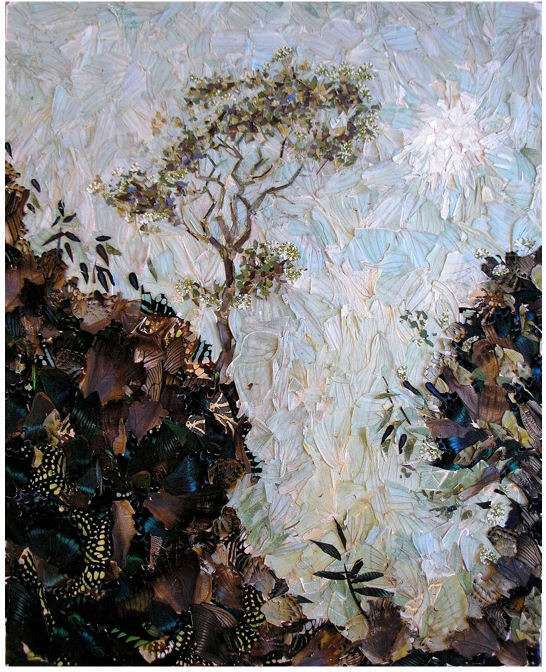 Somewhere near Moscow, artist Vadim Zaritsky, uses deceased butterfly wings to create mosaic artworks portraying landscapes, personal portraits and still life. As an entomologist and butterfly collector Zaritsky, driven by his creative perception led him to pioneer a new sector within the mosaic realm by using these wings to create masterpieces that create an unquestionable natural aesthetic. The artist expressed how the utilization & occurrence of this specific material began blossoming a new world within his imagination; “A butterfly lives for just a few weeks, while my pictures give people a chance to admire it for many years”. We most definitely agree; with his inspiration he immortalizes the majesty of these beautiful insects. In memory of the legendary music persona David Bowie that recently passed away we introduce you with a recent mosaic art of Pop movement artist Joe Black. 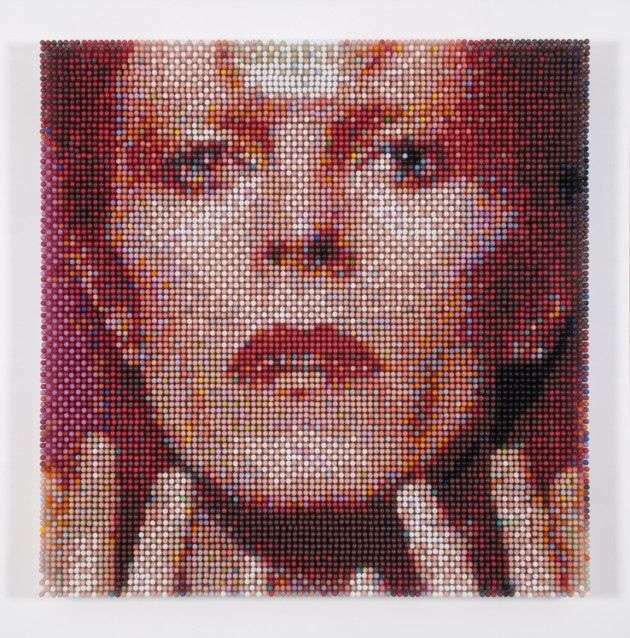 Depicting the British rock icon, Black used 9.000 individual multicolored test tubes on a vertical surface to create the desired pointed effect; each test tube almost representing Bowie’s extreme external appearances over the decades. His meticulous work gives emphasis to the significance of observing art, both from far and close up,to truly understand the art from both perspectives. This is a one of a kind mosaic idea. It’s a self-portraitrecreation of the Italian renaissance artist and inventor, Leonardo Davinci and was made by the 7-time Guinness World record holder Saimir Strati. Saimir Strati is an Albanian based artist that created spectacular mosaic art designs using wine corks, coffee beans, nails, toothpicks and even screws. 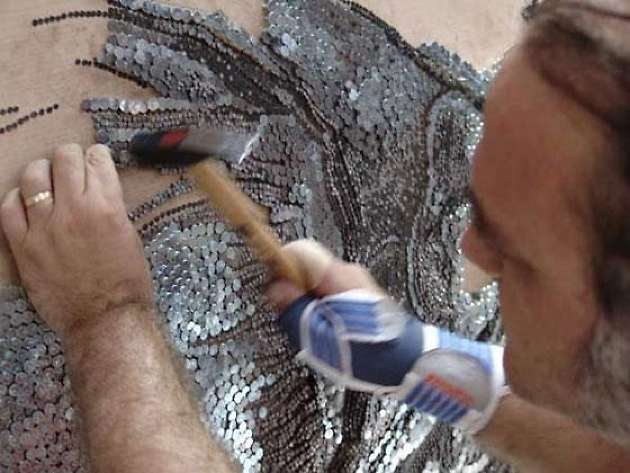 In 2006 this spectacular mosaic had been awarded with the Guinness World record for the world’s largest mosaic artwork made solely with industrial nails; the piece weighs approximately 880 pounds and its 2×4 meters of surface. 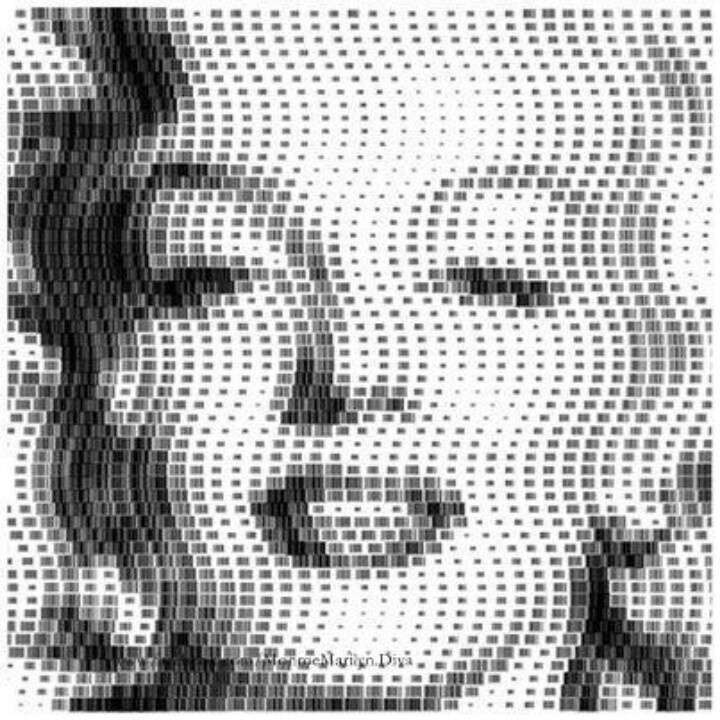 Scott Blake is an ingenious mosaic artist that takes mosaic art form to a completely different level by creating portraits of famous icons using nothing but bar codes. However,his plentiful creativity doesn’t just stop there, he unlocks a new way of embodying technology in art. The inventive artist has created an interactive mosaic art form, where scanning the bar codes entailed with a barcode reader on the mosaic will refer you to short clips or flashing images of the illustrated actor.On the Marilyn Monroe interactive portrait the artists used 1,944 barcodes, derived from 22 movies of the famous actress. This technique enables you to watch the American actress and model in black & white and color movies that she has appeared in throughout her career. 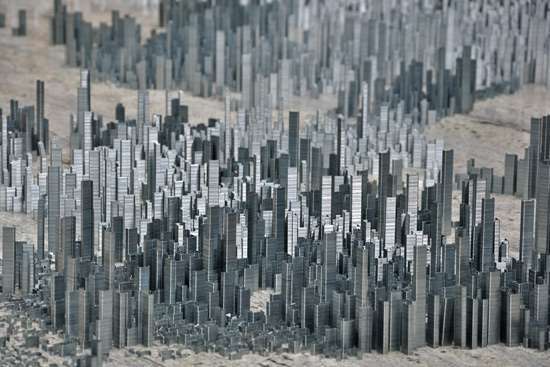 This aesthetically minimalistic but simultaneously technically sophisticated mosaic artwork was made by Peter Root in 2010.The so called Ephemicropolis, constitutes one the latest mosaic artwork of Root built with 100,000 staples in a range of sizes and have been cautiously arranged and organised on a 600×300 cm area over a period of 40 continuous hours. Ephemicropolis depicts a futuristic simulation of city scheme displaying small and large buildings. This mosaic project required a lot of patience, physical stability and mental dedication in order to be completed with perfection. When your hear the word “mosaic”,instantly your thought flies to the ancient traditional art form. The aforementioned artists have surely been capable of creating ripples throughout the mosaic world in the past years. 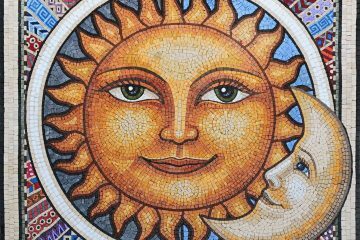 Mosaic art is a fruit of passion that is passing from generation to generation, simultaneously evolving its prehistoric roots into inspiring contemporary artists to materialize and apply their arty ideas to the mosaic canvas. 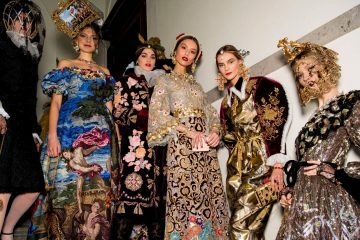 And as the influential Dutch painter VaghGoh once stated “Great things are done by the series of small things brought together”; mosaic art form enables the artist to consider a plethora of materials with almost no limitation as their inspirational muse. Have a quick look at our best selling items selection and explore an unparallel range of existing mosaic art designs, each of which can be customized in order to meet your special requested and create a unique mosaic art piece of your desire.